Before you walk around barefoot or slip your foot into your shoe you might want to check for a potentially dangerous scorpion that's looking to warm up as the weather cools. Under the nearly full moon, there is a predator on the hunt. It glows under a blacklight and will fend itself with a violent sting if necessary. "Scorpions have a tendency to, instead of chasing after prey, they just sit and wait for something to show up," said Bryan Hurt with Ecogen Pest Control . Hurt says summertime is high time for scorpions, but as fall ushers in cooler weather, the creepy critters are drawn to our homes to warm up. 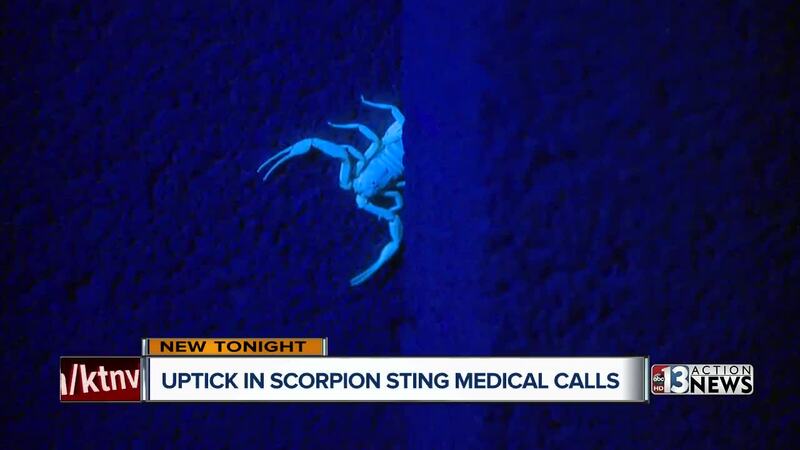 Hurt showed 13 Action News one home in the Northwest valley that has seen as many as 30 scorpions in a single night. "Well, that's a Bark [scorpion] right there," said Hurt while shining a blacklight toward a cinder-block wall. The Bark scorpion is considered the most venomous in North America and loves to live in the bark of palm trees. "They love to get into the cracks and crevices and the outcroppings of the outer walls," added Hurt. The formidable predators feast on bugs and even other scorpions. What makes them even more of a nightmare-- the bark scorpion can climb up walls. "Scorpion stings, we got a lot of those calls and a lot of times those callers our panicked," said Kari Dawson, who answers the new pilot 'nurses' line for Las Vegas Fire and Rescue. "They think they need to rush to the hospital and if we talk through it with them, and give them the information that they need, they are able to stay home in the comfort of their home with their family," added Dawson. 13 Action News asked Las Vegas Fire and Rescue about how many calls they receive regarding scorpion stings but that information was not immediately available. The Centers for Disease Control and Prevention recommends cleaning the sting area with soap and water but if there is difficulty breathing or symptoms deteriorate, to call 911. Contact a qualified healthcare provider or poison control center for advice and medical instructions. Do not take any sedatives. Capture the scorpion for identification if it is possible to do so safely.